Divide melon evenly into 4 individual dessert dishes. In small bowl, combine juice concentrate and ginger; mix well. Spoon 1 tablespoon over each serving. Just before serving, pour 3 tablespoons carbonated beverage over each serving. Sprinkle with lemon peel. This refreshing dessert satisfies the sweet tooth and provides one fruit serving as suggested by the Food Pyramid Guide. 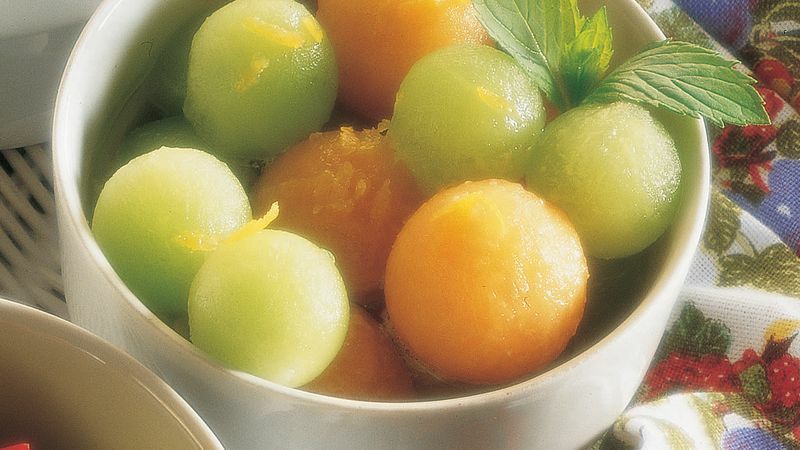 A melon baller quickly cuts round or oval-shaped pieces of melon. This popular tool can be found in the housewares section of many grocery stores and department stores.